To celebrate the opening of The World's Largest Dinosaurs, the Museum's new special exhibition, we've decided to slash our iPad app's price from $2.99 to $1.99. Grab it before this discount goes extinct! 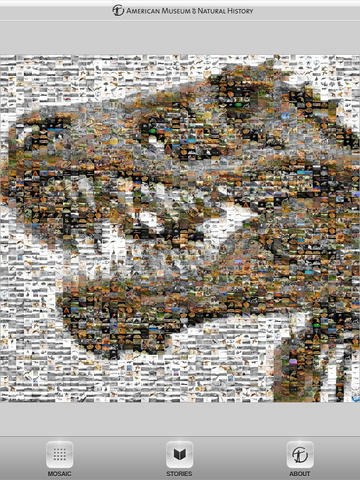 DINOSAURS iPad: American Museum of Natural History Collections contains a mosaic of more than 1000 images from the Museum's archive, woven together to create a striking image of the world’s most famous dinosaur, the Tyrannosaurus rex. Each interactive photograph includes information about where the fossil was found and the paleontologist who uncovered it. Post notes on photos and read other users’ comments on dinosaurs and science. You can also share favorite photos with friends so they can join your virtual dinosaur dig. In the Stories section, read about the science and personalities behind the Museum’s world-renowned fossil collection. Explore the history of fossil collecting and the Dinosaurs that roamed the Earth in sixteen detailed stories that take you even further into the Museum’s archives. Visiting the Museum? Let DINOSAURS iPad: American Museum of Natural History Collections be your guide. Use this app to learn more about the fascinating fossils you see while walking through the Halls. Exploring from home? DINOSAURS iPad: American Museum of Natural History Collections brings the Museum’s fossils to you. With 45 permanent exhibition halls and more than 30 million specimens and artifacts, there are more Collections apps to come!